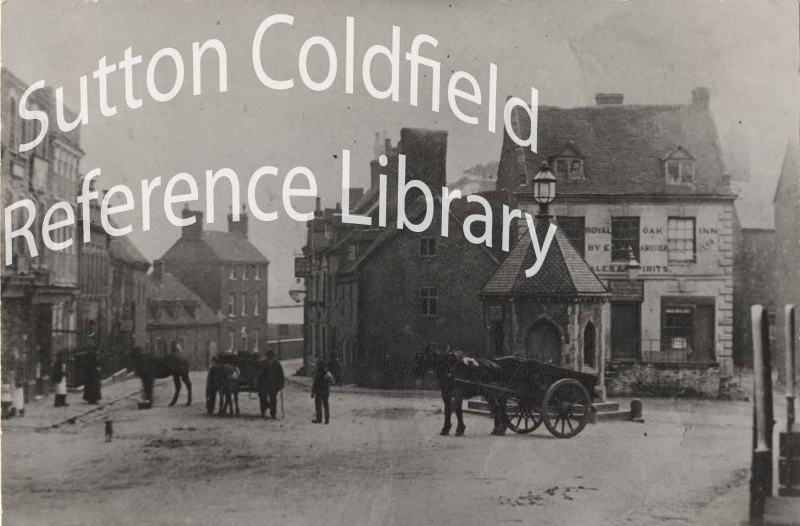 In the middle of the nineteenth century the town centre of Sutton was well supplied with public houses, some describing themselves as hotels serving the gentry, some of them lowly alehouses. One such alehouse, described by Richard Holbeche as “a low stuccoed beerhouse” stood where High Street meets Coleshill Street; the elderly publican John Weldon lived there with his wife Sarah. Richard Holbeche, writing in the 1890s, remembered it as “The Beehive”, but by the time he was writing forty years had passed since it ceased to be a pub, and the building had been demolished and replaced by a row of shops (now known as Estate House). In the 1860s Mrs. Weldon’s licence was transferred to Thomas Archer. Archer owned premises in Mill Street, vacant since the butcher and chandlers shop run by Mr. Wilkins had closed. 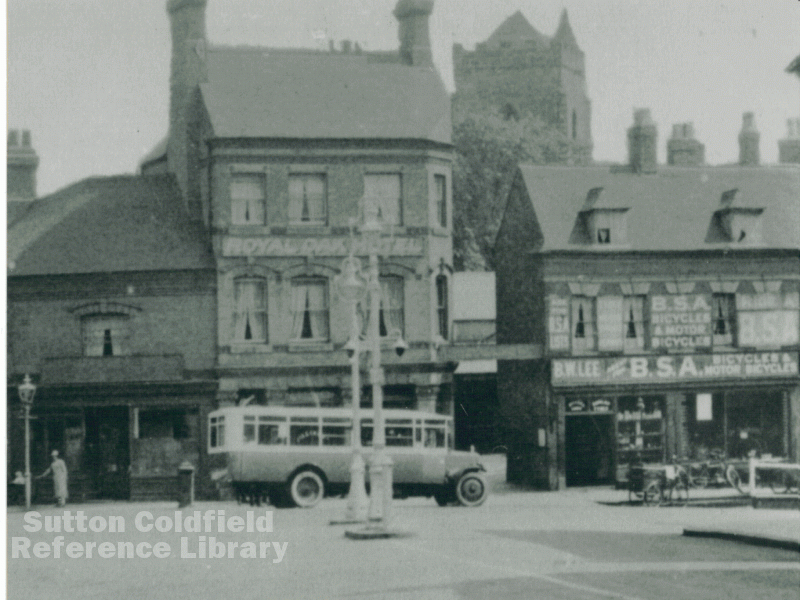 According to the Sutton Coldfield News of April 17th 1937, “The Royal Oak originated when the licence of the Dun Cow, which was held by a Mrs. Weldon, was removed to the premises recently occupied by Mr. Wilkins”. No doubt the names of pubs changed as often then as they do now, from the Beehive to the Dun Cow, and the replacement pub, in a larger building, needed a more dignified name - The Royal Oak. Elizabeth Archer was landlady at the Royal Oak Inn in 1888 when the dilapidated old building was pulled down and replaced the taller, more commodious Royal Oak Hotel. The rateable value of the new building was £42, compared with £14 for the old one, and the value in 1900 was £85. By 1900 the humble beehive had become the prosperous up-market Royal Oak Hotel, but it was not to last. The area declined, rateable values fell, and demolition loomed. The Royal Oak closed on April 14th 1937, as the Sutton Coldfield News reported - “At ten o’clock on Tuesday night Mr. George Edward Stanier, tenant of the Royal Oak Hotel, called Time, gentlemen please, and never again will the phrase be echoed within its walls.” The Royal Oak was one of the properties demolished to make way for Vesey Gardens in order “to transform what now seemed an eyesore into a beautiful picture”. (Article based on research by the late Kate Kendall). The Royal Oak Inn c.1880 - road improvements had lowered the level of the carriageway at the top of Mill Street, so a flight of steps led up to the front door of the inn.